Last updated 11:36 a.m. ET. Sonia Maria Sotomayor was sworn in this morning as the first Hispanic, and the third woman, to sit on the United States Supreme Court. Chief Justice John Roberts administered the Judicial Oath in the East Conference Room of the Supreme Court. Sotomayor, President Barack Obama's first High Court appointee, becomes the 111th Supreme Court Justice. As a successor to liberal Justice David Souter, who has retired, she is not expected to alter the court's ideological balance. 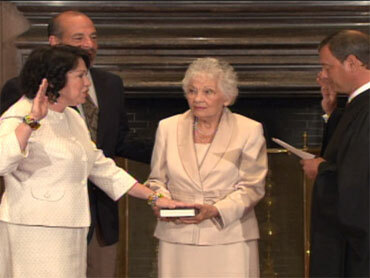 Roberts presided at two ceremonies Saturday officially making Sotomayor a high court justice, a lifetime appointment. In a private ceremony in the justices' conference room, Roberts administered an oath that the Constitution requires of all federal officials, to "support and defend" the Constitution. Then, in a public ceremony, he gave Sotomayor a second oath in which she pledged to "administer justice" fairly and impartially, as prescribed by a 220-year-old federal law. President Obama scheduled a White House reception for Sotomayor on Wednesday. Sotomayor, 55, has been a federal judge for 17 years. Obama nominated her in May, and the Senate confirmed Sotomayor's nomination Thursday by a 68-31 vote. Sotomayor can get to work after she takes the oaths, although the court won't hear arguments until Sept. 9, in a key campaign finance case. The entire court will convene a day earlier, however, for a formal ceremony to welcome Sotomayor. Many presidents have been on hand to see their nominees take their seat on the Supreme Court bench for the first time. President George W. Bush attended Roberts' ceremony in October 2005. Sotomayor is the daughter of Puerto Rican parents who was raised in a housing project in New York City's gritty South Bronx neighborhood and educated at the elite universities Princeton and Yale before going on to success in the legal profession and then the federal bench.